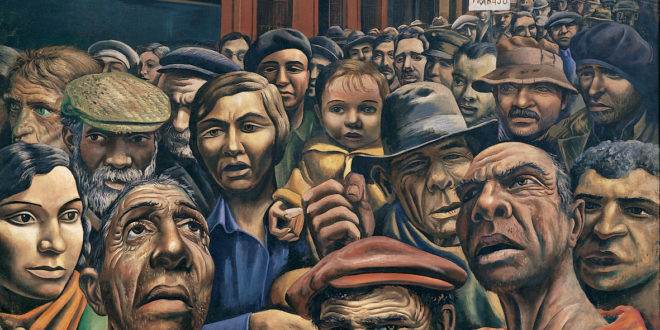 Antonio Berni | Manifestación (Public Demonstration), 1934, tempera on burlap, approx. 6 x 10 feet, MALBA, Buenos Aires. With Covington Catholic High School students offering a fresh examples of the embodied ideologies of Capitalism like racism, patriarchy and ecological destruction – we turn to theories of working class solidarity. If we want a social system that is not alienating—with meaningful labor, with equality in all spheres of life, with true, substantive democracy, with poisons removed for our soil, air, and water, with as much protection as possible from life’ slings and arrows—then capitalism and its interconnected processes and institutions, its embedded ideologies, must be destroyed. My guest via Skype is Michael Yates, the newly retired editorial director for the Monthly Review Press from 2006 to 2018. Yates has just published a new book, Can the Working Class Change the World?, published by Monthly Review Press. His other books include Why Unions Matter and A Freedom Budget for All Americans: Recapturing the Promise of the Civil Rights Movement in the Struggle for Economic Justice Today, co-authored with Paul Le Blanc. In his new book, Yates condenses decades of activism, organizing and teaching into a kind of primer on the working class and capitalism, and more powerfully offers practical actions the working class needs to commit to in order to change the world. We begin with exploitation and expropriation: Capitalism’s twin pillars of abuse and theft–and how this frames and limits the ways humans can even conceive of alternative ways of organizing society. We then move quickly to the necessity of envisioning and propounding a very anti-capitalist set of essential positions through which we might begin to understand how the very American and very powerful myth of individualism keeps us separated from a much needed working class solidarity. Our lives depend on that solidarity. Michael D. Yates began a University teaching career in Economics at the University of Pittsburgh’s satellite campus at Johnstown in the mid-70s where he participated in union organizing activities, first with the maintenance and custodial workers on campus and then with the teachers. He traveled all over the state of Pennsylvania and into West Virginia and Ohio, educating workers about labor unions, their right to form a union, and economics. He taught for many years in the Labor Center at the University of Massachusetts-Amherst, where his students were union officers and members.